The Bentley Continental R was introduced in 1991 and although it ceased production in 2003 it remains a respected, admired and sought-after luxury coupe. The Continental R was the first Bentley for more than 25 years to use a body style not found in the Rolls-Royce range and it allowed the marque to strike out on its own bold path. The Continental R may have been outgunned by the introduction of its more powerful stable mates, the Continental S and T, but it still offers a fairly full-on experience, with its huge bulk being pushed to blistering speeds by the 6.75 litre turbocharged V8 engine. While the modern Continental GT Bentleys have a distinct look, there is little to match the original Continental R when it comes to presence. The aggressive grill, 210 inch length and sheer weight of the car means that it is impossible to ignore. On the inside you can rest in comfortable luxury if you secure a front seat, but squeezing into the back is a bit of a tight fit, particularly in the headroom department. Bentley went to town on the interior, but only in the sense that it shopped around for third party components and then mixed them all together in an only partially successful manner. That's not to say that the Continental R feels tacky; it has simply not aged well when compared with its modern equivalents. 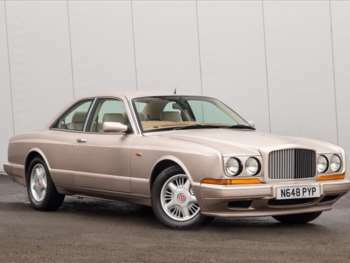 For an original Bentley Continental R first purchased in 1991 the current market will price it at around £27,000, assuming that it has a decent number of miles on the clock. The Continental R is generally more affordable than the S or T, with later models setting you back £35,000 or more, depending on the quality of the example. Be aware that depreciation can be quite steep for newer models, so going for an older Continental R will mean that your investment drips away at a slower rate. In fact you could find that the right car will end up holding and even increasing its value over time. Modern Bentleys benefit from VW Group workmanship and reliability, but cars from the 1990s still require a degree of caution when they are being bought used. Get an expert inspection if you want to avoid any dodgy examples and always make sure that there is a full service history from a Rolls-Royce approved company. You should also consider that buying a second hand Continental R will be best carried out through an official dealer rather than a third party or an individual seller. Bentley Continental R parts can be costly, as you might imagine for a vehicle of this type. A starter motor will set you back the best part of £400, while the alternator is nearer to £700. Replacing the exhaust system will leave you £1200 poorer. Put your foot down on a straight and you will be surprised how effectively the large engine is able to shift the bulk of the Continental R forwards. It is not exactly a sporty drive, but it does offer plenty of power and is also a great provider of long distance comfort, as long as you are up front.